"This is an easy mix-it-up-in-one-bowl-and-cook recipe. I make it for every brunch I attend. You may substitute chopped spinach for the broccoli if you wish." In a large bowl, beat together milk, eggs, baking mix, butter and parmesan cheese. Batter will be lumpy. 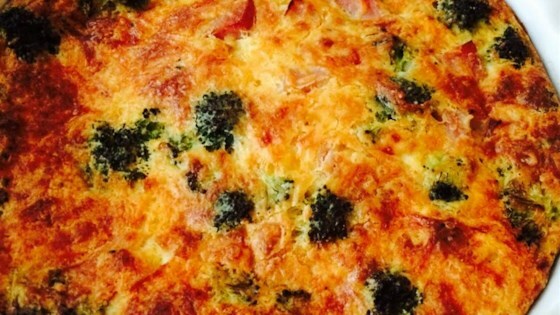 Stir in broccoli, ham and Cheddar cheese. Pour into prepared quiche dish. Delicious! I always make this dish for our family holiday pot-lucks. I put the mixture in little individual muffin pans and it's always a hit and cooks much faster! Thanks for the recipe! So quick and easy! Delicious, and with it's own crust too. I've added peppers, onions, used spinach, bacon bits, etc. Can't go wrong with this one.